djkardkreations: NBUS #5 Ends Soon! And a Bevie of Birthday Wishes! NBUS #5 Ends Soon! And a Bevie of Birthday Wishes! Sadly, the challenge is ending at 11:55 pm PST on Friday, September 18, 2015! That's very soon! Again, thank you so much to all of you who have already played along and been so enthusiastically supportive of using your NBUS! I appreciate it! I also want to again thank the magnificent paper craft companies who are generously supporting me on ride #5! If you haven't already, please stop by their blogs when you can and leave a personal thank you! We would all love to have them come back and support the next NBUS Challenge! There are a LOT of amazing prizes being offered! Finally, as a last reminder, please make sure you are following the rules! 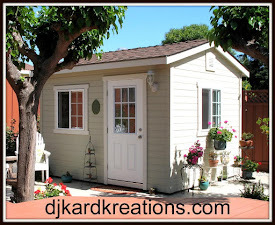 And to all of my new followers: in order for me to find you and introduce you in my New Friends Corner, please make sure you leave me a comment or email me (darnell dot knauss at gmail dot com) to let me know the name of your blog ~ or let me know if don't have a blog. Thank you! I will be introducing you over the next few weeks. I'll be back on Sunday to post the names of all the winners! Good luck, everyone! So? How are you? I hope your week is going well! I was able to get out to the Playhouse and make a card last Sunday, but I held off posting it until today because today is my friend Bev's birthday. Naturally, I call her Bevie! 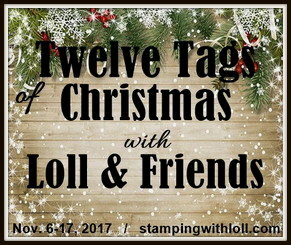 She is a fellow BABE, she makes outstanding cards, and she writes a delightful blog called Happy Dance. (You know you're gonna love someone with a blog name like that!) Aside from her artistic bloggie self, Bevie is a wonderful, kind, funny, fun-loving, and supportive friend. And she loves music! Very often inside her blog, you will find Bevie hosting marvelous birthday parties for others. Today our mutual friend and fellow BABE Anita of My Papercraft World is turning the tables and hosting a virtual birthday party for Bevie! Please drop in to wish the Birthday Girl a Happy Birthday and stay to enjoy some virtual cake and bevieges! Happy Birthday, my friend! I send you a bevie of birthday wishes! I applied three rows of NBUS musical Washi tape from Tape Works to my white card base and then I ran it through the BS with a Cuttlebug embossing folder. 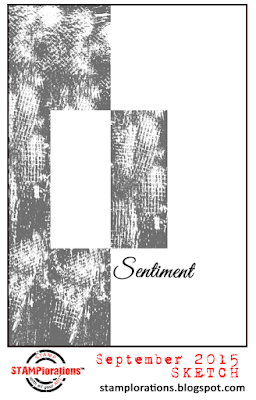 I stamped the SU sediment in between the scales. On a separate snippet I made a miniature version and applied it off-set, inspired by the sketch below. Walla! Just the juezz this QACAS card needed for a finished look! CAS-ual Fridays CAS Challenge: Musical. STAMPlorations September Challenge: Theme and Sketch. 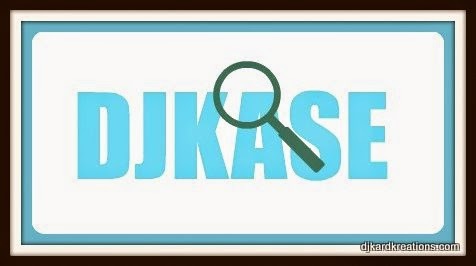 I actually made a "DJKASE" of my friend and STAMPlorations Designer, Julie B! Check out her card here! We've had a bit of a setback on the surgery recovery. Kevin has been having severe pain and swelling in his calf and foot, far worse pain than the site of the hamstring reattachment. He has had this condition before when he has had leg hematomas, so we weren't overly concerned. The doctor, however, was concerned when we saw him for a follow-up visit yesterday. He wanted to rule out that the cause was DVT (blood clots), so we were sent for an immediate ultrasound. Unfortunately, the results were positive. He is now on medication to break up the clots and once that takes affect, he should be a lot more comfortable. We dodged a bullet there! Thank you again for all you thoughtful comments, your cards, and your prayers! On a final note to this colossal post, I'm happy to report we are fortunate not to be in the direct line of any of California's raging firestorms. Our hearts and prayers go out to those who have lost their lives or property due to the infernos. 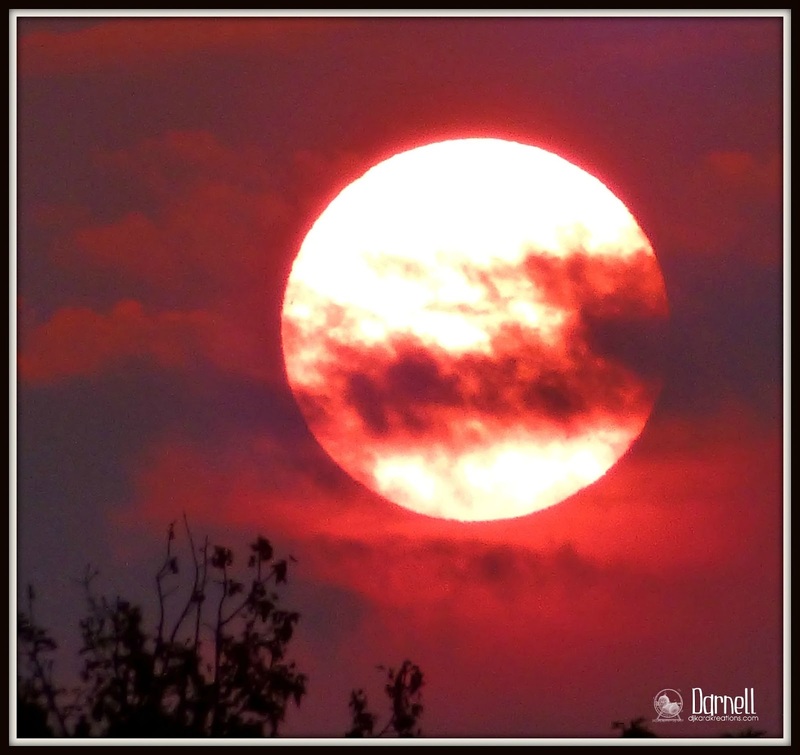 The fires currently burning throughout the state are causing these stunning and vibrant red sunsets. Beautiful, but bittersweet. Glad your hubby is now getting the treatment he needs and hope he is pain free very soon. What a great musical card! I love how you've used the washi tape. Love, love, love your card Darnell. Especially as the music theme is one I particularly love. My NBUS project is made and awaiting photography and blogging. This will happen today, one way or another. Your card is fabulous Darnell, such a wonderful design and a great use of the sketch. It sounds like you have had a difficult few days. Sorry to hear about the Mister's set back, thank goodness the doctor sent him for an immediate ultrasound. I hope the medications works quickly and he is soon feeling loads better. A fabulous card and very effective use of the washi tape, love it. Hope hubby's recovery is swift and snag free from now on. Beautiful card!! So sorry to hear about the Mister ... Thank goodness they caught that DVT in time! Tell ya what Darnelle you just crack me up. First thing I notice is Hammie doing the good old thumbs up. So cool. Next I hope hubby is getting better and you and Hammie are looking after him well and keeping nurse Ratchet away from him. Love your card for Bev just perfect, had a giggle to myself when you said you put the card stock thru the BS and of course I thought you were swearing then..... Then realised it must be short for?????. Anyway off to do a last card for the challenge and to wish Bev a happy birthday. Be well. WOW - that card is a show stopper for sure Darnell. I simply adore it and I'm sure Bev will too. Sorry to hear the Mister is having some trouble . . . I hope Nurse Nelly is still on hand! Hope he feels more comfy soon. Good luck with all that commenting on your NBUS challenge . . . it's a woolly mammoth of a task! Make sure Hammie doesn't get trampled by the Mammoth! Love love love that card! LOVING the music notes!! And sorry to hear about hubby's set back! I hope the meds help!!!!!! What a fantastic card! Love that layout and the musical theme! So perfect for Bev! Hope Mister feels better soon! That was close! Thinking of you both! I am going to enter, I've been working on my project for around a week and it is still not done! Won't be long now - I hope. I blame Tim Holtz! So glad to hear that Mister was immediately attended to and a 'situation' averted! Yikes! The sunset: gorgeous, but...We had a few like those (once the smoke lifted) and yes, bittersweet is most apt. You've created the perfect card for our sweet Bev, who will be singing and happy dancing in absolute delight when she sees - and receives - this marvelous beauty! Love this immensely!! Love your card, such a neat sketch and appropriate to have a song on a birthday! Sending thoughts and prayers for Mr and very glad to hear that you're not facing the firestorms on top of Mr's recovery. Wishing you a great day, my friend! So sorry for your hubby, I wish him a speed recovery. The California's inferno is just terrible. We have seen it in TV. :(( I hope that they succeed in extinguishing the fire. Love the card Darnell! That is a stunning sunset, but the reason for it breaks my heart. I'm glad to hear you aren't in any flamey path! Love the musicalcard tou made! Think she will like it sooo much! And maybe you will have to go on after Christmas; everybody is so enthousiastic! So you will have no time to be bored for a long time. 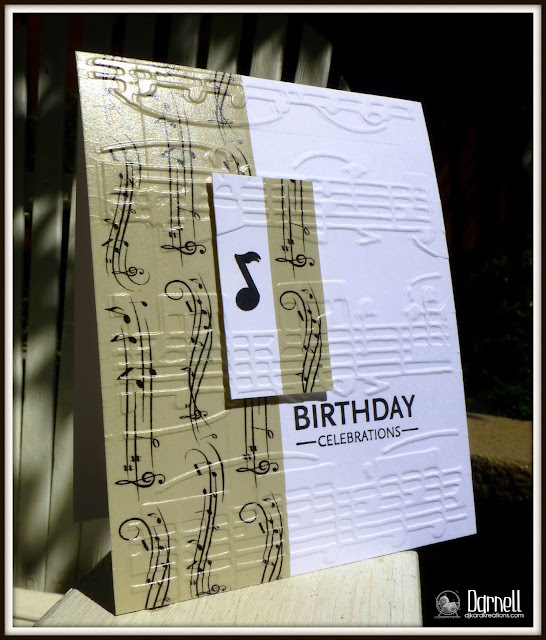 Beautiful musical card you made ! great use of the washi tape ! So sorry to hear Kevin is having some problems, but sounds like the DR. is getting it all taken care of. Sending prayers your way. The fires are horrendous, we NEED that El Nino to appear ASAP, our poor fire fighters are exhausted. I love the music elements and the offset design. I am going to file this away to use for the church choir director for Christmas. Glad you caught the clot problem. Hope hubby recovers quickly. This is a stunner of a card. I would never have known that was washi tape. I love the reverse way you used it. Bev is a lucky gal to have a friend like you. I'm so glad the Dr. insisted on the ultrasound even though he's had that before. You never know and thank goodness he is getting meds to break up the clots. I'm sending you happy wishes and hope he feels better soon. The fires are so devastating and it's heartbreaking to see so many people lose their homes and all they have. Prayers and hugs to you both. And Hammy since he is doing his part to help too. Our birthday girl is sure to love the song that your card is singing, D... so pretty! I keep forgetting to link to the NBUS contest!!!! ARRRRGh!!! Today, it is my challenge to do so!!! I want MORE of that incredible SCHTUFF!!! Hoooray for Bev! Much like you, she is one of theeeeeeeeeee kindest, nicest souls on the interwebs. I just love her incredible spirit! The card you made for her is SOOOOOO cool. I'm not just saying that because you used the STAMPlorations sketch - it seriously hits all the right notes. There is nothing flat about it. It looks very sharp. Ok. I'm done now. As for the Mister, I'm very sorry to hear that his foot is not cooperating with recovery. I hope he heals quickly. First of all.....your card is so pretty and I know she'll love it to pieces! Great musical themed card! So sorry for the setback on the Mister and know you have your hands full to the brim right now. Glad they caught that in time and can get the meds started! Whew! Sending healing vibes your way! So glad y'all aren't close to any of the fires! So sad that all that's happening. Oh Darnell, your poor husband, so glad you had that follow up doctor appt and had things checked out! Beautiful card for your beautiful friend, Bev! Just adding my good wishes for Kevin to everyone else's. Hope he is feeling better every day. Love your positive/negative card and the embossing. Gonna try that! 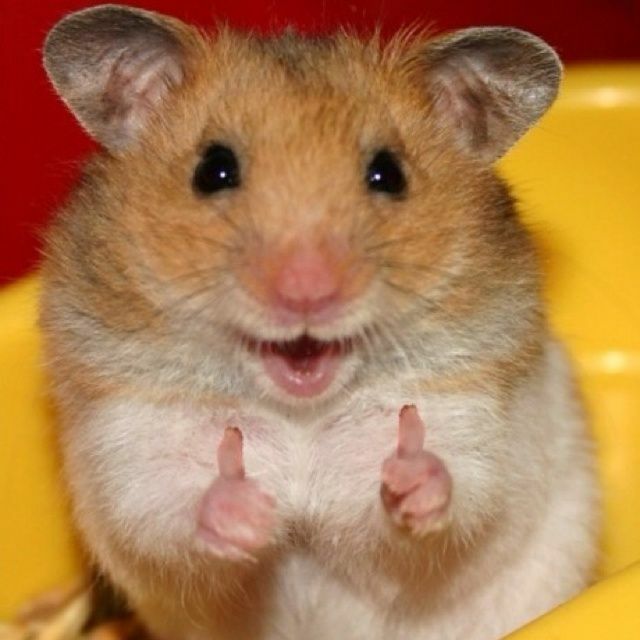 And what could be cuter than two-thumbs-up Hammie?! Made me smile, yes it did. I am so sorry for your scare with the blood clot , thank God for that doctor! I love the beautiful card you made for sweet Bev, I need to look at it again its amazing! Oh Darnell! So sorry for Kevin's set back, but thankful he has meds to deal with the blood clot, continuing prayers for his recovery ~ scary stuff! Happy to hear you are not in the line of the horrible fires in CA~also very scary. What a great card! I'm so glad you're not threatened by the fires. And I'm glad that your husband has been given medication to break up the blood clot and will hopefully be doing much better soon! So much to talk about today Darnell! First your little Hammy is the cutest little guy ever - and that he reminded you of that old punch - I just recently parted with most of mine - off to the local grade school for the kids at craft time. .. Your card blew me away that you embossed the washi - and the shine in the photo! And then to read about your Kevin. Thank goodness you followed up and had his leg checked. The blood clots .. don't even want to think about what would have happened if those went undetected. 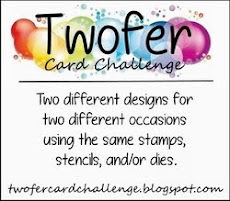 I hope to enter a 2nd card in your NBUS challenge, but have been suffering bad allergies/headaches lately. Glad to hear Dear hub is doing better. One of my favorite funny, but true bumper stickers says, "Getting old ain't for sissies!" As my friends, hub and I get older, I am understanding this witty piece of information! Bevie is gonna love her birthday card! It is beautiful! Love all the embossing and the musical notes! Sorry your hubby had a setback! Hope he feels better soon!!!!!! Your card just speaks to me! Love the washi tape, glimmer from it, and the offset too. So glad the Mister was able to find out the cause and the Dr recognized it right away! Hope his recovery continues. It's wonderful that you are not a part of the fires, but again, so sad for those affected. Beautiful card and I appreciate your explanation. Glad to hear your husband is now progressing. I'm familiar with DVT and it is definitely not fun but can be very scary. Glad he's being treated correctly for it. I guess that's why they call it "practicing" medicine. Sometimes it takes time to get it right. It's great you are out of harm's way of the fires. It's amazing at the catastrophe loss and destruction they are causing. Such a great card. Sorry to hear about the surgery setback. Hoping things are better from here on out. Glad you are not hear the fires. Brilliant card, what would you do without Hammy, great photo of him by the way. Sorry about Hubby but at least the Doctor was on the ball, lucky to have one like that. A fabulous card Darnell, the musical washi tape is great and so is the embossing. I really like the offset panel as well. Sorry about the Mister's setback, thank goodness the doctor recognized the problem. I hope his medication takes effect quickly and that he soon feels better. Wow what a lovely card and a perfect take on the sketch. Hope the Mister is doing okay (and you too). Dear me, why didn't I think of embossing washi tape. It's awesome looking. I must have nothing but air between my ears. Dropped over the "Bevie's" blog to see what she is up to and wish her a Happy Betterday. Based on the looks of it, the NBUS challenge is massive. You may not finish your personal messages until Spring 2016. Really sorry to hear Mister is having issues. Great that you've caught, though. Hope he gets some measure of comfort soon. Sending prayers. Though your picture of the sun is amazing, I, too, am so sad about the devastation these fires have wrought on the residents in their paths. Thinking of them and the exhausted firefighters work in the front lines. So much to read and so much to say I hardly know where to begin. I have my NBUS card ready and will be posting it shorty. I'd like to get another one done but let's see what time has to say. I love your card for Bev. I didn't know what to do with that sketch but you did a perfect card. The picture of Hammy is adorable. I'm so sorry about the Mister. What more can happen to that poor man. My prayers for healing and thankfulness that the doctors caught the DVT. I was looking on the map yesterday to see how far you were from the fire in Middletown. I'm glad you are out of harms way and add my prayers to yours for those who have lost everything. Now that my rambling is done, my gratitude to you, Darnell, for your thoughtfulness, delightful sense of humor and generosity. Your NBUS challenge is a great success. Congratulation! I'm sending best wishes for your husband! Thanks for the reminder for the NBUS Challenge! I'd better get with it! Been a bit slow since I returned from my trip to CA. What an experience it was, though! Loved every minute of it. I will continue to pray for your husband. So glad you caught the blood clot before it began to travel! Your card is fantastic. Since I studied piano my entire life, I love anything to do with music. Your card shows some serious creativity! Love the embossed background with your inset. This is one cool card, Darnell! I love the Washi scales going vertical and the embossed ones horizontal and that little musical note is brilliant! I'm glad you're safe from the fires. They are so devastating! Hope Kevin's recovery takes a turn for the better! Poor thing. Gorgeous card Darnell and I know Bev will just love it. I love your use of that music Washi Tape, just too stinkin' clever and so elegant too. Just perfect for the birthday girl. Sorry to hear about The Mister's setback but happy that they picked it up and started treatment ASAP! Glad you are safe from the fires - it is a horrifying time - hope you continue to KEEP SAFE from the fires and the smoke! THANK YOU for an AWESOME challenge - you would not believe how much I am looking in my stash with renewed interest now!!! I am just IN AWE of you and the AMAZING person you are - You and your husband have been in my prayers - I hope things improve!! Good on you for making such a beautiful musical tribute to your friend Bevie of Happy Dance!!! Wherever you go (or whatever you do) YOU do with your WHOLE HEART!!! Hoping for the best for you and thanking you for the beautiful things you add to others' lives!!! Hugs to you!! What a beautiful card. I love the musical washi tape you used and then embossed with a musical EF. I like your music card for Bev, very pretty!! SO SORRY to hear the Mister is having complications. I'll be sure to keep him in my prayers. I am glad that Mister saw the doctor and sending my prayers and very best wishes for a complete and smooth recovery. I hope he is feeling better with each day! The fires...just a terrible situation and my prayers for you and yours to remain safe. You are so fortunate to have access to a fast acting medical system (sadly something we lack here in Canada) that recognized and treated Mister's condition lickety-split! Darn near fell off my chair when I saw your card! Embossed washi tape ???? Say what? NEVER in a million years would I have thought to do this! The result is INCREDIBLE! My new #1 Favorite Darnell card! Yes, beautiful photo...but definitely bittersweet! Love the music themed card - must remember to CASE it one day. And thanks for the reminder that NBUS ends soon - can't believe how quickly September is passing! Stunning card Darnell - love the way you have interpreted the challenge at STAMPlorations. 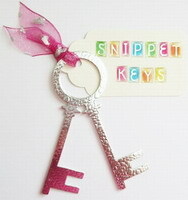 LOVE the washi tape embellishment...I thought it was stamping at first glance! 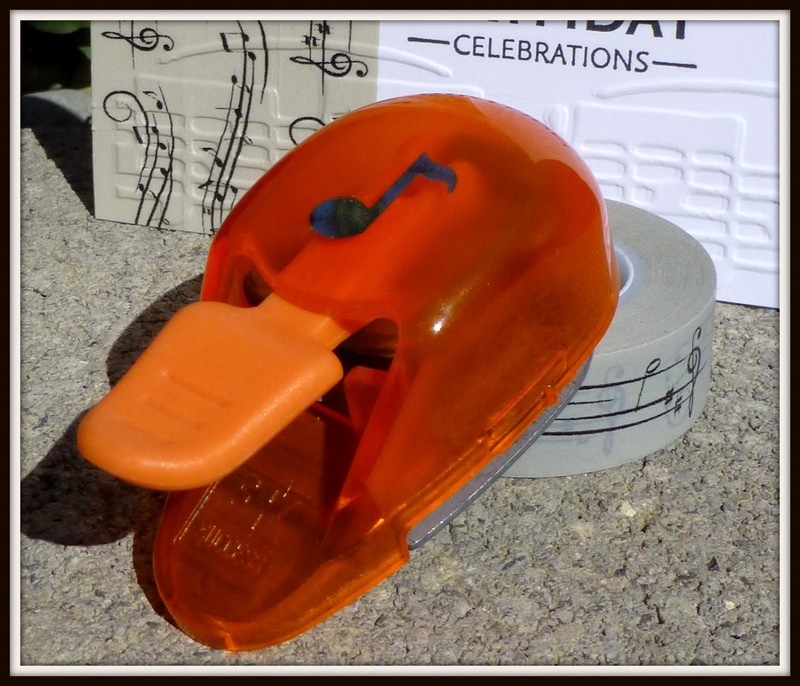 That embossing folder couldn't be more perfect with the musical theme and I also have one of those old music note punches (probably in the very same orange color) that I had forgotten about. Crazy how just that extra little bit of punched card stock finishes the card off perfectly! So sorry your husband's had a complication but how lucky it was caught early and treated. You do not want to mess around with blood clots hanging out in your body, that's certain. Hope the meds do their work and that the Mister is feeling more chipper soon. Wonderful card I am sure your friend will enjoy!! What a great little punch you have, too..perfection!! Glad your hubby went and they figured out what was wrong, scarey!! The fires are terrible and my heart goes out to each and everyone that had a lost, it has to be so devastating! Praying for the Mister and you! Beautiful card too! I'm so glad you've had good news on the Mister!! And that you are out of range of the fires. I always feel a little guilty here in Colorado when I'm complaining about eyes burning from the smoke from California. As if my eye problems even compare to the devastation. But on a lighter note - fabulous card! LOVE the way you have used that sketch with your rows of washi. The old punch provides the perfect balance. Bev is fabulous, isn't she? She goes all out for virtual birthday parties. 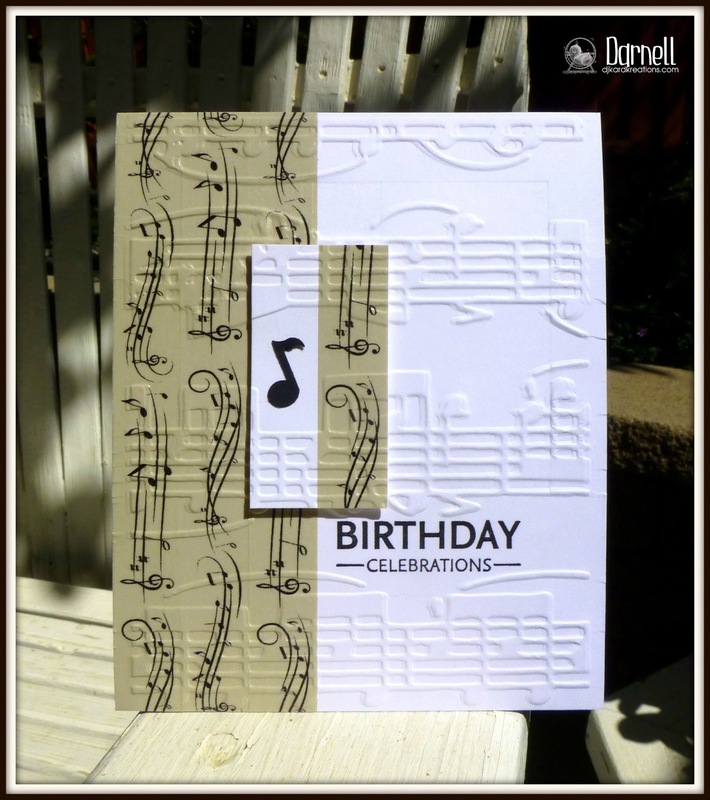 Great card for a music lover!!! I sure understand why the doc was concerned about your husband and glad he is getting some meds to take care of it. Positive thoughts coming your way. It get the fires, it is bad here too. Although we just had a couple days of very soaking rain and some snow in the mountains. I was wondering if you were in the line of the fires. I'm so glad to hear you are not. This card for Bev is wonderful! I love the music theme going on. I wasn't aware that Hammy had opposable thumbs, now I know how he gets into all that trouble! I'm going tonight to thank your sponsors, how thoughtful of them, but who wouldn't want to sponsor you?! If I owned a crafting store, I would sponsor you too! I did it! Only just in time! Love the Hammy photo. Hello Darnell! Sorry to read the Mister is having such a rough time of it. Glad they found the problem before things got worse! Take care and have fun with all these fun birthday parties happenin'! OMG Darnell, I Love your dry eb musical notes, Brown and white color combo and punched note. TFS mf. So, so sorry The Mister had to be lucky enough to get a complication--what a bummer, but so glad they figured it out! Your card for Bev is an absolute masterpiece--creative & beautiful, my friend! What a fab musical themed card Darnell and a great take on the sketch. That photo of Hammy really got me smiling this morning! Sorry to hear your hubster is still not recovered from his hammy problem, good job the doc followed up. First I must tell you that I adore your music themed card. MY DIL is a music teacher and I am always looking for ways to make her smile. Second, I am very sorry about your husbands leg problems. I hope he will soon be right as rain. I am not sure I will hit #3 of my NBUS quota, but it has been shear pleasure. Now I am off to work. Wonderful take on the sketch, Darnell. You two were so clever to think of that punch, it really finishes the card off. Sorry to hear about the setback in DH's recovery, but I'm happy the doctors found the cause in time. I went for a cortisone injection yesterday, and it's amazing how it is relieving the pain and improving the movement of my shoulder. I'll be resuming physiotherapy this Wednesday to start continue on my recovery. Sending positive thoughts your way! A fantastic card Darnell, I'm just going to send you a big hug and hope hubby's recovery is all good!! I am so sorry to hear that your husband had a setback. My friend had a blood clot when she had knee surgery last year and it was so painful. I am glad that you caught it and he was put on medication to break it up. Your card is so fabulous!!! I love the use of the washi tape. Have a wonderful day! Such a fun and super sweet card, Darnell! Such a gorgeous card, Darnell! I love the contrast. I'm glad to hear that your husband is on the mend and I hope that he continues to heal - so glad that the doctors were on top of it and able to catch it early. Also relieved to hear that you are safe from harm. Keeping CA in my thoughts! Sorry to hear about the clot. I had the same thing happen 12 years ago after a fall. I had a pain the night before my 10 day checkup. When I told the doctor about it next day, he sent me for a ultrasound and found 2 DVTs. I feel lucky in a way that they were diagnosed before they caused any real trouble, and believe I have a angel looking after me. Obviously he does too !!! LOVE the card. I am sure Bevie will love it too. So glad to hear you caught the blood clots in time. Praying that Kevin heals quickly. Wow, this is really an elegant looking card and a great use for the washi tape. I admit to having washi tape that I've never used but now I'm tempted to pull it out and use some as a border. I've been reading your blog all along but just realized that I never actually became an official follower so I just took care of that too (on Google and Bloglovin'). No blog because I can barely keep up with my two little girls and squeeze in some craft time, but I do love reading yours! Best of luck to your husband and hoping those clots dissolve right away! What a relief with Mister, Darnell, tricky, but glad your doc was careful and wise. Pray for speedy recovery and also for dear Brenda and hubby with their sad news. Glad you're not in fires path, but have been praying for folks over there, some Aussie firefighters from here have travelled over. Our turn will come. This card is gorgeous! I love the washi tape! And the single 8th note punch was just the ticket. Good eye Hammy! I'm so glad your husband is okay and that the blood clots were caught early. I'm also very glad to hear you are not in the path of the fires. My prayers are with everyone, too, whose lives have been altered by the fires. So sorry to hear that Kevin had a setback with his recovery. Thank goodness for his 'on the ball' doctor!! Sounds like he is in very good hands with the both of you. I love the colours on this card and the shine from the washi tape is beautiful. I bet Bev LOVED this card and I'm so glad you shared it with us at CAS-ual Fridays too!!! YIKES, poor Mister! So sorry to hear of the added complication with his recovery and hope that he will make a speedy and complete recovery over time. Sorry to hear that the Mister has had some issues. I know exactly what that is like and how it feels for the spouse/partner, for a change. My DH has history with those DVT things and is on meds for it, permanently. It happened to him multiple times and took a while to get sorted but he's doing okay with the meds. So sorry to read that the Mr. has had a set back. Hopefully by the time this posts (I am way behind on blog reading and commenting) he is feeling much better. Your take on the sketch is so pretty. I love your choices. Spectacular Birthday card. I love how you started off with washi tape. You'd never know if you hadn't fessed up. I think I have a little music note punch too somewhere. Sorry I missed your challenge but have been away attending a Memorial Service for a very dear friend and just couldn't get my act together in time before we left. So glad to hear The DVT was picked up by your doctor. We have tons of rain here if only we could ship it off to you! Hugs Mrs A. Terribly sorry to hear about your Mister Darnell!!!!... HUGS!!! Before I read your post Darnell I was trying to work out how on earth you'd created the gold background...washi tape never occurred to me! It looks amazing and I love that you found the perfect punch to fit the musical theme! Hope the mister is doing ok...my Mum's just had surgery this week and it seems to have knocked her for six. Hope he is recovering well now. Glad to see you're not in the direct line of those fires! Such a creative design :) Love it! Wowza! Love the drama you created with the embossing and the color!! Thanks for playing along with the CAS-ual Fridays Challenge! 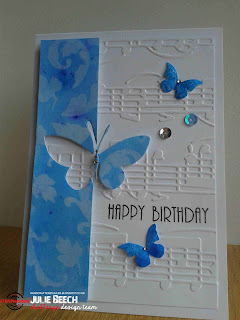 Beautiful take on the theme and the sketch, loving the combination of tape and embossing. Thank you for joining STAMPlorations September challenge, hope to see you back in October. Congrats on your top pick win at STAMPlorations. I knew this card was a winner when I first saw it. Can You hear the applause???? As i’m so late to wish you on special birthday, so i should be so sad to miss like this incredible day when you were born. All happy Birthday wishes fly to you!